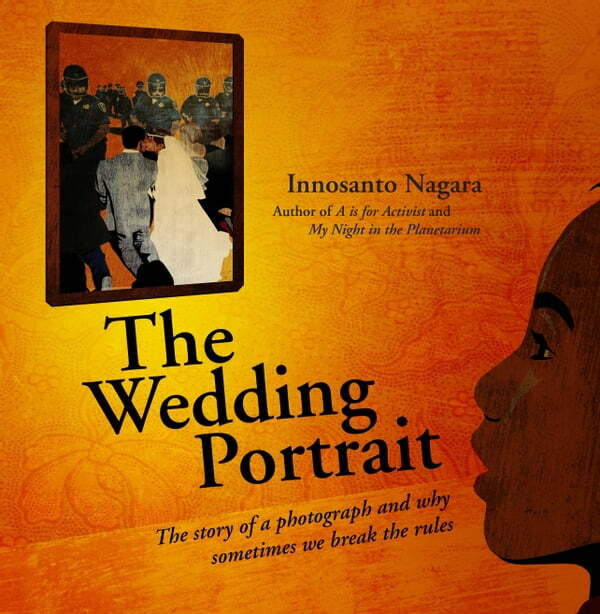 The Wedding Portrait is an essential book for kids about standing up for what's right. Here are stories of direct action from around the world that are bookended by the author's wedding story. He and his bride led their wedding party to a protest, and were captured in a photo by the local newspaper kissing in front of a line of police just before being arrested. "We usually follow the rules. But sometimes, if you see something is wrong--more wrong than breaking the rules and by breaking the rules you might stop it--you may need to break the rules." When indigenous people in Colombia block an oil company from destroying their environment--this is a blockade; when Florida farmworkers encourage people not to buy their tomatos because the farm owners won't pay them for their hard work--this is called a boycott; and when Claudette Colvin takes a seat in the front of the bus to protest racism--this is called civil disobedience. In brilliantly bright and inspiring illustrations we see ordinary people say No--to unfair treatment, to war, to destroying the environment. Innosanto Nagara has beautifully melded an act of love with crucial ideas of civil disobedience and direct action that will speak to young readers' sense of right and wrong. There has never been a more important moment for Innosanto Nagara's gentle message of firm resolve.